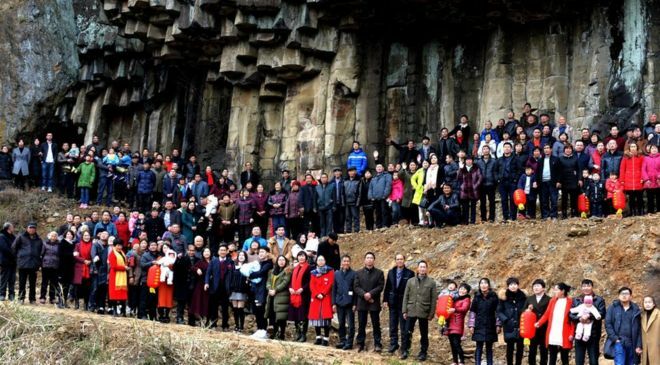 More than 500 members of one Chinese family have posed for the ultimate family photo, BBC reports. The pictures were taken at a Ren family reunion at Shishe village in China's eastern province of Zhejiang. It was held last week during the Lunar New Year period, which is usually marked by the Chinese with large family gatherings and meals. Photographer Zhang Liangzong took the pictures with a drone in front of basalt formations near Shishe. He told the BBC that the Ren family, which originates from the village, can be traced back 851 years, but their family tree had not been updated for more than eight decades. Village elders recently began updating the family tree records and managed to track down at least 2,000 living descendants spanning seven generations, Mr Zhang said. They marked the family tree's completion by holding a massive reunion, and managed to gather more than 500 people. Family members came from Beijing, Shanghai, Xinjiang and Taiwan.